Whups, meant to do this yesterday. Ah well. The 2018 thread got to over 2000 posts... let's see where we land this year! The New York State Common Retirement Fund committed over $1.9 billion of capital to fund managers in October, according to a recently released report from the country’s third-largest public pension plan. The investor most significantly built out its private equity portfolio, adding four new regional funds to its lineup in the asset class. Hellman & Friedman IX received $325 million from the investor to carry out its strategy targeting large-cap companies primarily in the United States and Europe, and KSL Partners V took home $300 million to invest in the travel and leisure industry. Subsequently, New York Common put a particular focus on Asian private equity, committing $500 million to strategies spanning the region. New York Balanced Pool Asia Investors III and New York Co-Investment Pool Asia III received $200 million and $300 million, respectively. Ariel Investments, a global equities manager, received mixed attention.. The Ariel Investments Micro Cap account was terminated on October 3. The account value of approximately $54 million was allocated to cash. Following that, Ariel was hired and funded with $300 million for a separate investment strategy. The fund then continued its regional focus on the Asia markets with a $225 million commitment to ARA Real Estate Partners Asia II, a closed-end, diversified pan-Asia commingled real estate fund managed by ARA Private Fund Platform. EQT Partners then received a €250 million ($286 million) commitment for the EQT Empire Credit Solutions SCSp entity. The fund is expected to target investment strategies across the credit spectrum ranging from stressed and distressed debt, middle market finance to “high-quality business,” and senior secured and second lien financing. There was no activity across the $207.4 billion institutional investor’s emerging manager, real assets, absolute return, and fixed income portfolios, the report added. Alex Doñé recently took the helm as the new chief investment officer of the Bureau of Asset Management, providing direct investment advice and direction to the five New York City’s retirement systems. “These changes will reduce future risk to taxpayers and Act 5 will result in lower costs overall,” said Dan Egan, spokesman for Gov. Tom Wolf’s Office of Administration, which handles personnel. Retirement benefits would fall 18 percent for new school employees, and 6 percent for affected state workers, compared to employees hired since 2010. That translates into retirement reductions of $7,327 to $33,173 for school workers served by the Public School Employees Retirement System (PSERS). Benefits would fall $6,452 to $34,048 for new state workers covered by the State Employees Retirement System (SERS). Future school employees also will be charged operational fees for their 401(k) accounts through PSERS’ contractor, Voya Financial. The Morning Call could not determine annual costs. Because the plans are not mandatory for existing elected officials and personnel, they will not lower PSERS’ and SERS’ combined $72 billion debt taxpayers must pay for pension plans obligated to future workers and retirees. The debt was caused by three main factors. From the mid-1990s until 2010, governors and lawmakers in both parties decided not pay the employers’ full annual share of workers’ retirement benefits and they permitted school boards to do the same thing. In that time, lawmakers also gave themselves and all other employees and retirees retroactive pension bumps that sapped assets. Then market downturns crushed those assets further. It’s true the law will not impact the debt, said Rep. Mike Tobash, R-Schuylkill, one of the law’s main architects. However, he said, taxpayers will experience less risk of higher debt because the plans are not fully backed by taxpayers. Tobash declined to say whether he would drop his fully backed retirement plan for one of new plans, saying he will weigh the personal and political exposure of that decision by the deadline. There’s no chance all or even a majority of the state’s 253 lawmakers will line up for the new pension plans, said Barry Shutt, a retired Agriculture Department worker from Lower Paxton Township, Dauphin County, who advocates for lawmakers to pay off the state’s full pension debt. As of mid-November, the state had 72,677 employees, the lowest level since the 1960s, according to the Office of Administration. That reduction is caused in part by attrition. The number of retirements and resignations has been nearly double each year since 2009, records show. The administration has not forecast how many employees may need to be hired next year, Egan said. But the governor does not believe prospective employees will be scared off by the new retirement options, he said. “The changes provide some more flexibility for people passionate about public service but prefer a shorter tenure in state government,” Egan said. On Dec. 14, SERS mailed letters to its active members informing them of the option of switching plans, but it’s doubtful many will exercise that option, said Joe Torta, the agency’s director of member services. “I’m not anticipating a lot of shifting into hybrid because the current benefit structure is higher,” he said. Still, the law has required SERS to reorganize its operations, Tobash said. Staff rewrote brochures for how the plans work and compare so current and prospective employees can make the best decisions for themselves, he said. It also had to make other changes to ensure the 102 government agencies that are part of SERS file employees’ paycheck information correctly. SERS also got approval to hire 13 more employees to help with the roll out, SERS spokeswoman Pam Hile added. PSERS also is scrambling to get the new accounts. “It is an enormous task for us with a very tight deadline, educating all 700 [plus] employers on the new reporting and benefits, updating business processes, computer systems and educating members,” PSERS spokeswoman Evelyn Tatkovski Williams said. A new pension plan for government workers in Pennsylvania is now in effect. The new law creates a new retirement plan that will put half of the savings into a fund backed by taxpayers. The other half will go into a 401K. Governor Wolf says it will reduce risk to taxpayers and lower costs. It's expected to save taxpayers at least $43 million per year for the next 3 decades. 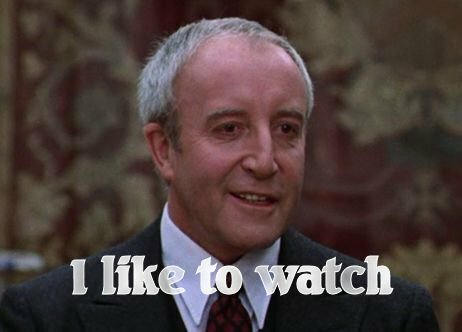 It appears that Nevada pension officials have exhausted all judicial avenues in their cynical effort to conceal information from taxpayers about the retirement benefits they fund for public employees. But given their well-established preference for ignoring the law, such an assessment may prove premature. Last week, the state Supreme Court rejected a request from the Public Employees Retirement System to reconsider an October ruling that details of public pension payments are not exempt from state open record laws. It was an easy call. The case was brought by the Nevada Policy Research Institute, a free-market think tank in Las Vegas that has fought for two years to gain access to information about pension payouts. The ruling marked the second time in five years that lower courts and the state’s highest tribunal had turned away efforts by PERS to keep the data confidential. But even though retirement system officials have lost in court at every turn, history indicates they will continue to delay and deflect — and potentially seek legislative redress. A top-ranking PERS official at one point even offered misleading testimony to a judge about the system’s ability to produce the data. To make matters worse, PERS has farmed out much of its legal work to a private law firm at a cost of tens of thousands of dollars. Thus the agency uses taxpayer money to wage war against those very same taxpayers, who have a right to know how their contributions are being spent. PERS controls assets worth more than $35 billion and has an unfunded liability of about $13 billion, depending on who’s counting. Many public-sector pension funds throughout the country are in precarious financial condition, and a lack of transparency only exacerbates the problem by preventing private-sector taxpayers from accessing information necessary to adequately assess decisions made on their behalf. With PERS now out of options at the Supreme Court, the matter will go back to Carson District Court Judge James Wilson, who initially ruled against the retirement system in July 2016. The time has come for PERS officials to accept the court decisions and follow the law. The system’s animosity toward accountability and its refusal to comply with state statutes are affronts to democracy and the rule of law. Judge Wilson should quickly schedule a hearing on the matter, make clear that any further obfuscation on the part of PERS officials or attorneys will result in sanctions and institute a hard deadline for the release of the records. Although states have a history of making adjustments to their workforce retirement programs, changes to public pension plan design and financing have never been more numerous or significant than in the years following the Great Recession.1 The global stock market crash sharply reduced state and local pension fund asset values, from $3.15 trillion at the end of 2007 to $2.17 trillion in March 2009,2 and due to this loss, pension costs increased. These higher costs hit state and local governments right as the economic recession began to severely lower their revenues.3 These events played a major role in prompting changes to public pension plans and financing that were unprecedented in number, scope, and magnitude. Since 2009, nearly every state passed meaningful reform to one, or more, of its pension plans. Although the global market crash and recession affected all plans, differing plan designs, budgets, and legal frameworks across the country defied a single solution; instead, each state met its challenges with tailored changes specific to its unique circumstances. For example, some states faced legal limitations on how much modification could be made to their existing retirement plans. Other states did not require major law changes due to their financial condition or the presence of automatic adjustments in their plan designs. Doing this would increase average annual pension fund returns statewide by at least $418 million over 20 years, the study’s authors, Anderson Economic Group, LLC, argued. This would go a long way in helping municipalities meet the state’s goal of pensions being 90 percent funded by 2040. At present, for example, the fire and police pensions are both below 70 percent. Anderson Economic Group examined what would happen if the state government voted to ease the investment restrictions on local pension funds with less than $10 million in assets — that is, allow them to invest more than the 40 percent of its funds in the stock market or to be able to diversify portfolios more liberally. The study showed that gains for the 228 smallest funds in Illinois would average as much as 5 to 6.8 percent per year if the restrictions were eased. Yearly returns for the Pontiac pension boards have typically been much more meager: in their joint January report from last year, the fire pension fund had received a return of 6.5 percent while the police pension fund had an investment return of 6.3 percent. These rates of return were much healthier than their respective 0.8 and 0.7 percent returns the year prior. Something that has been suggested to reverse ballooning deficits is for consolidation of police and fire pensions with the statewide Illinois Municipal Retirement Fund, which currently provides pensions for many city and county workers who do not fall under the umbrella of fire and police employees. Since it is structured differently and subject to different investment rules, it is at present about 97 percent funded. Anderson Economic Group warns against such consolidation in its study, however. Such a consolidation would require that all assets from each local fund be liquidated and then re-invested in the larger fund, the group stated, noting that this move would generate a one-time cost of up to $155 million in commissions, taxes and other fees, which would increase the pension funds’ unfunded liability by that amount as well. Moreover, consolidation poses an even higher risk if the transfer occurs during a period of stock market growth and the local pension funds miss out on the resulting dividends from their existing investments, the study found. IPPFA President James McNamee argued that consolidation would also take control away from local municipalities; however, given that some municipalities are less than 50 percent funded at present, taking control might bring some measure of relief from the pension burden. Kentucky has been gripped in a years-long debate about how to shore up public employee retirement funds and slow ballooning pension costs that are crowding out other government services. Its neighbor to the south has no such worries. The Tennessee Consolidated Retirement System is one of the healthiest pension plans in the nation. It has enough assets to cover more than 93 percent of its promised pensions for teachers, state and higher education workers, and many local government workers — ranking it among the five best-funded state plans in the U.S. The national average is 66 percent, according to research by the Pew Charitable Trusts. Kentucky, on the other hand, has just a third of its liabilities covered, leaving $33 billion unfunded. “Tennessee is one of the states that just stands out as one of the best run in the country,” said Greg Mennis, director of Public Sector Retirement Systems for The Pew Charitable Trusts. So how did it get on such solid footing? We take a look at some key moves taken by state officials. Every year, since at least 1972, the state has made its full pension payments recommended by actuaries. In other states, such as Kentucky and Illinois, politicians short-changed the annual pension payments. Facing recessions, they chose to fund schools and other services instead. Tennessee's investments had suffered losses during the Great Recession and the annual required pension payments were climbing — a scenario that played out across the country. When investment returns fall short, governments have to set aside more funds to meet future retirement benefits. By the time Tennessee Treasurer David Lillard took office in 2009, the yearly pension cost had climbed hundreds of millions of dollars over the previous decade. “That was not a sustainable path,” he said. Lillard proposed a “hybrid” retirement plan for new state employees that combined a 401(K)-style savings account with a traditional “defined benefit” pension. While existing employees would still get their promised pension benefits, workers hired on or after July 1, 2014 would be subject to the new rules. Under the hybrid plan, employees pay 5 percent of their paychecks into the pension plan. Previously, state workers paid none and teachers paid 5 percent. Employees also now bear more of the risk if investments underperform. The new arrangement caused the state’s annual pension contributions to level off in 2011. In Kentucky, meanwhile, the annual pension cost climbed from $624 million in 2008 to $1.5 billion in 2017. The legislature passed a reform bill in 2013 that moved some employees to a hybrid plan, but the changes were not enough. Gov. Matt Bevin proposed another set of reforms in 2017 that would have moved teachers into 401-K style plans and cut benefits, but it was met with stiff resistance from labor. Then in early 2018 the legislature passed a pension reform bill, essentially in secret. Labor leaders sued and the Supreme Court stuck down the bill in December. Bevin then called a special session of the legislature, but it was cut short. The General Assembly is expected to take up pension reform again in 2019. A few other decisions helped set Tennessee on the right path. The state hasn’t taken on too many high-risk investments such as hedge funds, junk bonds, private equity and other alternatives to traditional stocks and bonds. Kentucky, on the other hand, invested heavily in hedge funds, which under performed and further eroded the pension fund’s assets. Tennessee lawmakers have also resisted changes to employee benefits that could further increase liabilities. In Kentucky, the legislature approved an expensive cost-of-living increase in the 1990s, when the state’s pension plans were fully funded. But really, the key has been consistent funding and reforms that slowed the costs: “Tennessee is one of very few states that has done both of those things,” said Mennis from Pew. The lawsuit claims the Kentucky Retirement Systems (KRS) lost money on more than $1.5 billion in hedge fund investments in recent years, although its own advisers privately urged it to stay away from the risky investments. A lawsuit claiming the Kentucky Retirement Systems (KRS) lost money on more than $1.5 billion in hedge fund investments in recent years, although its own advisers privately urged it to stay away from such “unacceptable risks,” has been moved forward by a Franklin County judge. The lawsuit was filed against investment firms and current and former trustees and officials of the KRS. The investment firms named in the suit are KKR & Co., Prisma Capital Partners, The Blackstone Group and Pacific Alternative Asset Management. According to the Courier Journal, the defendants asked that the lawsuit be dismissed on the grounds that the eight plaintiffs lacked standing. Franklin Circuit Judge Phillip Shepherd ruled that the plaintiffs “have a property interest” in the pension funds and that they “allege sufficient facts to demonstrate taxpayer standing,” the news report says. Only one defendant—the Government Financial Officers Association—was dismissed from the case. CHICAGO — Illinois municipalities outside Chicago are looking for relief from their considerable pension burdens as Gov.-elect J.B. Pritzker and the new legislature get to work in the coming weeks. Chicago and the state government get the lion's share of attention for their pension liabilities, but the weight of retirement burdens has dragged down the ratings of local governments across Illinois, driving up property tax bills and prompting some to look for alternative revenue sources to meet growing payment demands. Downgrades have stretched from governments in the Quad Cities region on the banks of the Mississippi and Peoria in central Illinois to both wealthy and impoverished Chicago suburbs. They’ve struck both home-rule and non-home rule governments that range on the ratings scale from high to low-grade. Since 2017, Moody’s Investors Service has stung more than three dozen local governments with downgrades in which pension burdens were cited as a primary driver. The latest came Dec. 21st when Moody’s lowered Elgin, a city of more than 100,000 35 miles northwest of Chicago, to Aa2 from Aa1. The downgrade that affects $77 million of debt “is based on the city's high pension burden and incorporates likelihood of further growth given current contribution practices,” Moody’s said. Some governments are at risk of losing their investment-grade status. In 2018, Illinois Comptroller Susana Mendoza’s office began enforcing a law that allows pension funds to intercept a local government’s share of state-collected taxes if the government's annual contribution falls short of actuarially required levels. State law requires most local governments to reach 90% funding by 2040 on their public safety funds. The impoverished Chicago suburb of Harvey was the first to be hit such an intercept request and a handful of others including Chicago have since faced such collection measures. While a flood of requests has not occurred, many municipal market participants are watching closely because such diversions could hurt a distressed government’s ability to provide critical services or push it to raise taxes to a level that drives residents out. Local governments can’t file Chapter 9 in Illinois. When Harvey was hit with the diversion, it cut its public safety staff. The city already levies high property tax rates and has poor collection rates. It eventually reached a court settlement with its police and firefighter funds that eased the diversion’s impact. The escalating pressures mostly stem from obligations owed to local government public safety funds. Most local municipalities with the exception of Chicago participate in the Illinois Municipal Retirement Fund but manage their own public safety funds. The IMRF is 89% funded and most local governments are up-to-date on actuarial payments. While the fund can now intercept state collected taxes like the public safety funds, it has long had the ability to enforce the payment of actuarial contributions by intercepting a single revenue source. In comparison, the 656 downstate and suburban firefighter and police funds are only 57.6% funded, according to pension data compiled for fiscal 2016 by the Illinois Department of Insurance. The state analysis reported that the combined shortfall for the funds of more than $9.9 billion had doubled from $4.8 billion a decade ago. Chicago’s net pension liabilities are $28 billion and Illinois’ are at $133.7 billion. "We have already observed pressure from rising pension costs for many of the issuers that we rate, as demonstrated by more frequent structural budget deficits, large tax hikes, and budget cuts that in many cases limit future operational flexibility, as well as reliance on reserves and other one-shot measures to address budgetary imbalance," S&P wrote in a report about the potential credit impact of the intercept law. About 34% of municipalities’ contributions are materially below actuarially sound levels and rising payments are expected to absorb a larger share of Illinois municipal budgets over time that will require higher taxes, spending cuts, or a combination. Some governments are looking for alternatives, including Alton, which is selling its wastewater treatment system to bolster pensions. The increased funding didn’t stave off a rating cut to A from A-plus from S&P in September. "While we recognize the sale presents a measure of budget predictability in the near term, the city will still have a significantly high pension liability and exposure to escalating pension contributions, and we believe it will need to devise a long-term plan to stabilize its policemen's and firefighters' pension funds," S&P analyst Helen Samuelson warned. The Illinois Municipal League and Chicago Civic Federation believe public safety pension fund consolidation would help. “IML’s top priority is working with the General Assembly to pass legislation to consolidate the more than 650 downstate public safety pension funds for the purpose of creating efficiencies, improving processes and reducing administrative and investment costs,” the league says on its website. Six proposals have been developed so far, according to the league. A seventh proposal, not yet in bill form, would maintain all current characteristics of each local pension fund, extend the amortization period to 2050 and reduce the required funded ratio target to 80%, and direct a study to examine the costs and benefits of full consolidation. Some proposals call for the various funds to be merged into the IMRF with differing levels of control and changes and others would establish a single police fund and a single firefighters’ fund. Consolidation is among reform proposals the Chicago Civic Federation will advocate for as part of its 2019 legislative priorities. “While these funds may enjoy local control over investing and disability decisions, the federation believes that overall investment performance and administrative efficiency generated by economies of scale would greatly improve if funds were consolidated,” the federation wrote. The federation also supports putting a constitutional amendment before voters in 2020 seeking to ease the state constitution’s stringent constitutional provision that prohibits any benefit cuts. The Illinois Public Pension Fund Association released a study last week that contends consolidation poses a risk and recommends easing investment guidelines for the state’s smallest funds. The study, performed by Anderson Economic Group LLC, contends 228 of the state’s smallest funds with less than $10 million in assets would average as much as 5% to 6.8% annually if the restrictions were eased, and this action would increase average annual pension fund returns statewide by at least $418 million over 20 years. “Expanded investment authority is the least cumbersome and most effective way to ease the local contribution responsibility,” IPPFA President James McNamee said. The study concluded consolidation would require asset liquidation and reinvestment fees of up to $155 million which would increase the pension funds' unfunded liability. The timing also poses risks if it occurs during a period of stock market growth and the local pension funds miss out on the resulting dividends. While heavy pension burdens have damaged the credit quality of many Illinois cities, towns, and villages in recent years, some have managed to withstand the pressure and maintain their “exceptional credit quality” despite the rising costs, according to a recent report from Moody’s. “Such cities typically have drawn on their strong legal revenue-raising flexibility and high median family incomes to support increased pension contributions while maintaining strong reserves,” Moody’s said. That flexibility stems from the home rule status of most cities which gives them broad revenue raising options and many benefit from strong income levels. Among the 13 Aaa-rated cities in Illinois, 11 have home rule authority. Home rule status is determined by population or a municipality can vote for home rule. Among all rated Illinois cities, 69% have home rule status. Most Illinois cities with exceptional credit quality are exceeding state required minimum pension payments and are doing it without draining reserves. The median Moody's (MCO) adjusted net pension burden liability for Aaa cities in Illinois is 2.7 times revenues, compared with 1.5 times for Aaa cities nationwide. Worries persist. 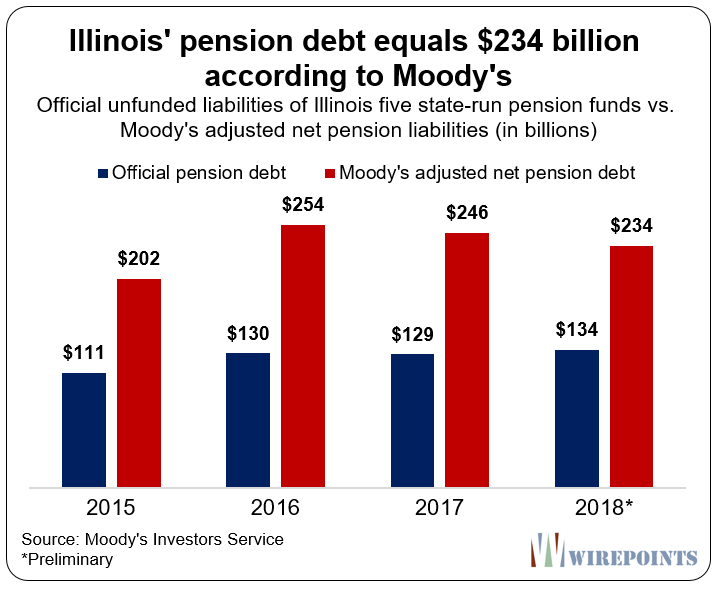 “If Illinois cities with large unfunded pension liabilities do not continue to absorb growing pension contributions—including costs that could arise should pension plan investment performance fall short of plan assumptions—these cities could face credit pressure,” Moody’s wrote.